Cargills Bank has introduced an attractive interest rate for the five years fixed deposit product in addition to the recently introduced higher interest rate on the one year fixed deposit product with the intention of enticing customers for better long term investments. An attractive 17% (13.09%.a.e.r) interest for five years fixed depositproduct is now on offer. The bank also offers 12.75% for one year and 12% (12.36%.a.e.r) for 6 months fixed deposit productsassuring a higher yield in the market for customers. “Our motive is to provide the community at large, the opportunity to make smart investments to gain a better yield over time and encourage them to save and secure their financial future. We are constantly initiating digital strategies to make life easy for today’s consumer as our DNA is digital and mobile. 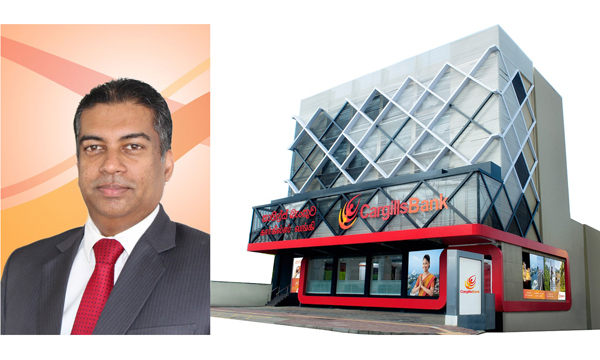 Whilst our super market banking concept allows customers to transact with their account through the nearby Cargills Food City whereby increasing our touch points, our internet and mobile banking platforms have further enabled customers to open their fixed deposit online by fund transfers, without having to visit a branch.” said Mr. Buddhika Perera, Head of Retail Banking at Cargills Bank. “We see a promising opportunity for long term investments at this juncture and our strategy is to fund our asset base through long term deposits. It is an exciting time of growth for Cargills Bank and we commit to offer outstanding banking experience to our customers with better returns and newest technology strengthened by service excellence.” he further added. The bank further encourages customers over “smart saving” through their current credit card promotion at Cargills Food City. The offer allows customers to spend up to Rs. 50,000 per month and in return, enjoy 15% savings as a cash-back to their Cargills Bank Savings Account, which further offers an interest rate of up to 8.25%.(p.a. ), creating a path to save on their day-today grocery shopping. “Cargills” is a brand that has been faithfully serving Sri Lankans for 174 years, built on a foundation of values and ethics. True to this heritage and the ethos of ‘Banking on the Human Spirit’, Cargills Bank is taking banking to the masses by being inclusive and accessible. The amazing Cargills Cash Savings Account is available at over 370 Cargills Food City outlets, allowing you to do grocery shopping and banking at the same place at your convenience. The Cargills Bank Credit Card with special offers is now a must-have for discerning customers.